Low-FODMAP smoothies can be a challenge. Smoothies often rely on a lot of fruit to make them thick so they can be very high in FODMAPs. This winning combination of bananas and peanut butter uses a few tricks to create a creamy smoothie that is so yummy it can pass as dessert. The two key ingredients to make thicker smoothies are frozen fruit and ground chia seeds. Prepare frozen bananas ahead of time to have on hand for smoothies. Peel the banana, break it into 6 pieces, and store them in the freezer in an airtight container or zip-top bag. Grinding chia seeds in the first step of this recipe increase their thickening power, plus you get some plant-based omega-3s. Add chia seeds to a dry blender (do not add to wet blender or they will stick to sides) and process into a powder, about 30 seconds. Turn off the blender. Chia seed powder may stick to the cover and sides of the blender; tap the sides or scrape down with a spatula to gather them in the bottom. Add yogurt, frozen banana chunks, peanut butter, and vanilla. Blend for 60 seconds. Stop and scrape down blender, moving any chunks that did not blend. Cover and pulse blender again until smooth, 30 to 45 seconds. One cup of lactose-free kefir can be used instead of 1 cup of lactose-free yogurt. Smoothie will be slightly tarter than with yogurt. This recipe makes 2 servings; it’s hard to make less in a full-size blender. Share with someone, or refrigerate half of it to eat later that day, or for up to 2 days. 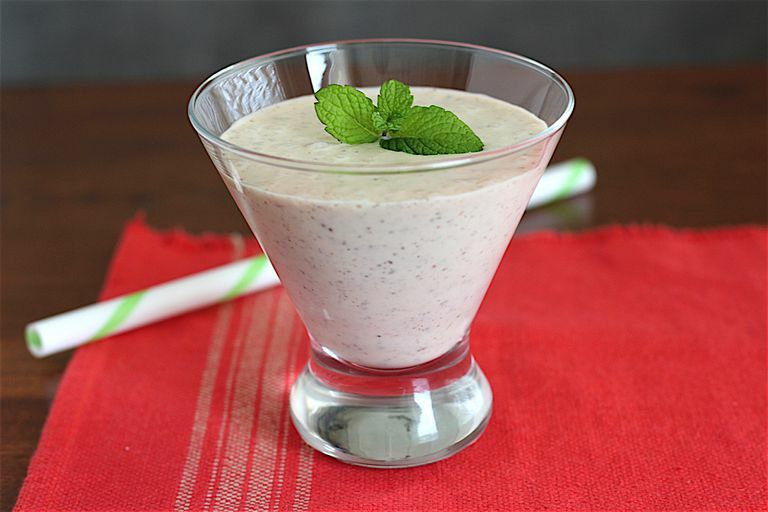 This smoothie will stay thick, so it is a great make-ahead breakfast or snack. Add a couple of drops of stevia extract if desired, for a dash of additional sweetness. If you don’t have a frozen banana you can still make a thick smoothie by chilling it for 10 to 15 minutes in the refrigerator or freezer before serving.